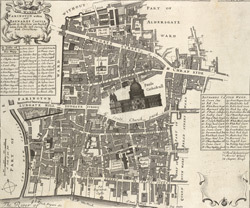 This plan was published in Strype's first annotated edition of Stow's 'Survey of the Cities of London and Westminster'. The plan's title features in cartouche at top left, with compass star and scale bar near bottom left. The keys to streets, yards, halls, courts and private properties appear in tables down both sides of the plate. St Paul's Cathedral and other prominent buildings are shown pictorially. Farringdon Ward was divided into Farringdon Within and Farringdon Without in 1394 because "the governance thereof is too laborious and grievous for one person to occupy and duly govern the same".